Within SharePoint 2010 Microsoft has changed a lot of the content management features. One of those features is content routing which you can do with the Content Organizer Feature. When you activate the Content Organizer feature on your site (Web scoped feature). It will automatically create a Drop-off library for you. All the documents that you upload to the site will be uploaded to the Drop-off library and that library will then route you document to the correct library or folder. 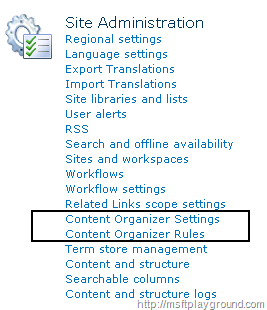 The settings for the content organizing can be changed by using two web settings features that can be found under the category “Site Administration” on the “Site Settings” screen. 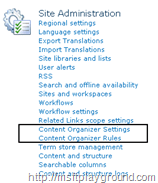 With the option “Content Organizer Rules” you can specify specific rules to route you content within the Site or outside your site collection. When you want your content to be routed outside your site collection the other site were you want the content to move to also has to have the “Content Organizer” feature enabled. On the screen that appears you can specify your sent to location. If you specify a rule that routes a document to another site collection the document will be placed into the drop-off library of the destination site collection. Then find the “Content Organizer Processing” Job specified for you web application. By clicking the name of the job you can reschedule the job to run within another time frame. Besides that you can also click the “Run now” button. It is said that Microsoft knows this bug so lets hope the will fix it in some kind of service pack. To be more flexible with the routing of your documents you can also create a custom router. I will discuss this option in a later post if there are enough people that will want to here about it. Good information! I’d love to see some information about creating a custom router. I’m looking to use the content organiser to automatically put documents into one of 15,000 folders (one for each client of an accounting firm). The client is entered into a lookup field. Do you know if Microsoft have fixed the issue of workflows not starting in SharePoint 2010 service pack 1 or in any of the cumulative updates? Muchas gracias por la información, me fue de mucha ayuda.